Bremerton doesn’t have the same cachet as the islands, but we recently discovered that it’s an awesome day drip with a toddler. Cheap, easy, and exactly the right amount of time away from home. We were impressed with how pedestrian-friendly and welcoming the area around the ferry terminal is. Full of public spaces and a nice mix of business, the waterfront area feels like it was designed to encourage people to stick around and enjoy–not just pass through. Logistics: Get an ORCA card and load it up to save time–you won’t have to stand in line to buy a ticket. Add an E-Purse to your existing pass to cover the difference between your usual fare & ferry fares. Light Rail to University Station ($2.00 from Beacon Hill), walk a few blocks to ferry terminal, walk on ferry ($7.10). All eastbound ferry rides are free, so we paid a total of $11.10 per person (free for kids under 5) for transportation. Ferries depart promptly, so plan plenty of time to get to the terminal–it’s a fun place to run around if you get there a little early and you don’t want to miss your boat. The crossing takes about an hour. Our door-to-door adventure was about 6 hours total: 40 minutes round trip on the train, 2 hours RT on the ferry, 3 hours play time in Bremerton & a little wait at both terminals. This gorgeous Art Deco building is only a few blocks from the ferry terminal. It’s worth the walk just to admire the building. We enjoyed playing with some puzzles, reading a couple of books, and cooling off in the air conditioning. Libraries are my go-to free, family-friendly pit stops. This place has great service and lots of good choices at reasonable prices. You set the pace: rushing for a ferry? Relaxing after you just got off? One beer or a pitcher? 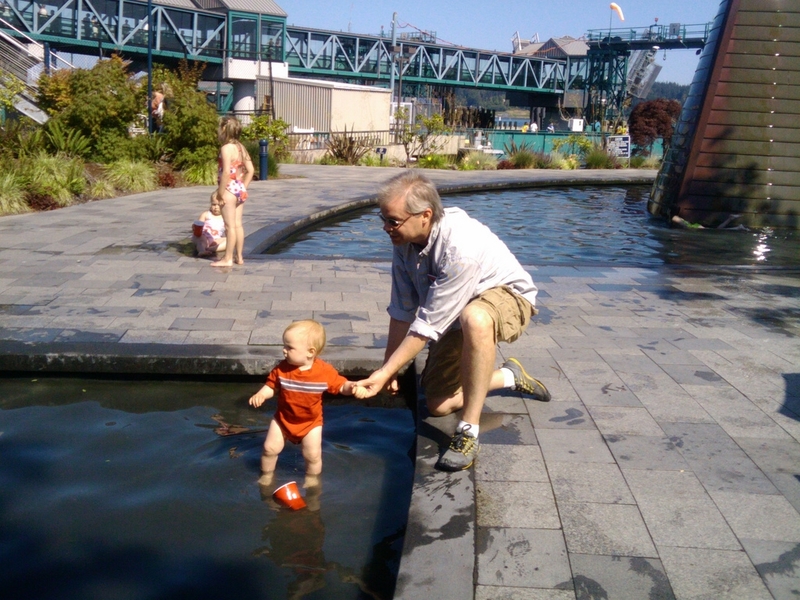 Incredibly family friendly–a great way to start (or finish) your visit to Bremerton. Other food/drink choices: chains (Starbucks, SubWay) and local delis, coffee shops and restaurants. I didn’t see a grocery/market, so be sure to pack well. We brought a swim diaper, a couple of disposable diapers, sunscreen, water, and light snacks. You can always get snacks & refill water bottles on the ferry, as well. Free, donations accepted. Stop by to admire the latest exhibit, enjoy the play area, and maybe pick up a puppet in the gift area. We were excited to see a Jabberwocky puppet and the baby really liked banging on the xylophone. This spray park is just steps from the ferry terminal and was full of local families. The facilities are clean, modern, and welcoming. The art is simple and attractive. Kids of all ages will go nuts for the water features. Pack a lunch (and lots of water) and enjoy. Go explore Bremerton & let me know what you think!